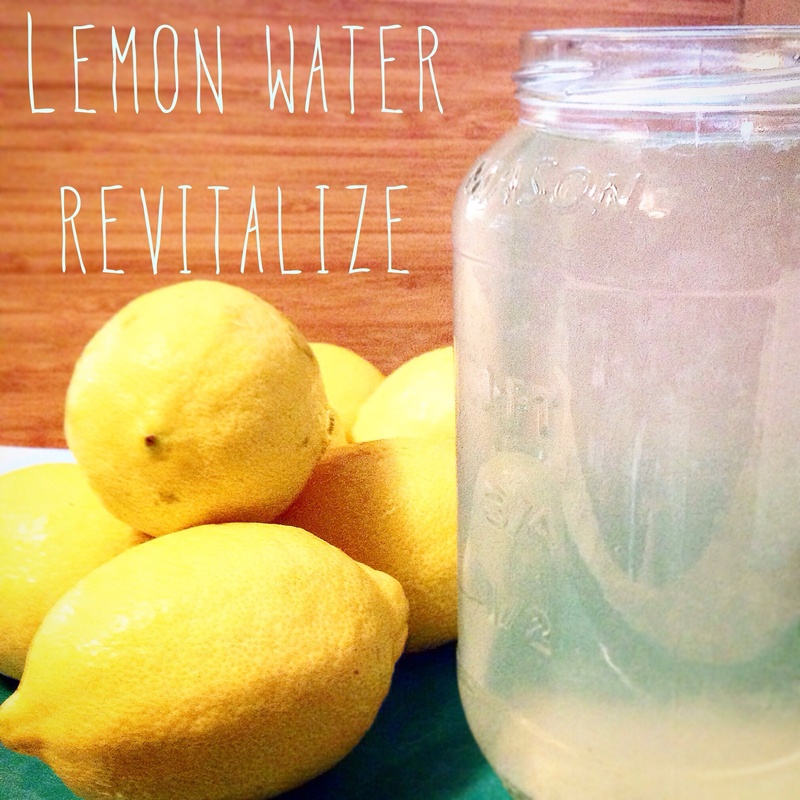 Lemon Water Revitalize: Why drinking warm, salty lemon water is AMAZING! Why I drink warm lemon water with a pinch of sea salt every morning and how you can too. I’m a huge fan of easy nutrition hacks and accessible foods used in nourishing ways. I commit to a few daily habits that are very advantageous to the overall functioning of my body. One of these habits is that first thing every morning I walk straight to the kitchen and put water on to boil for my Lemon Water Revitalize. It’s become a part of my morning ritual (along with bone broth). It’s easy, inexpensive, aids in digestion, promotes vibrant skin, hydration, detoxification, supports immune and muscle function and possibly even weight-loss. Lemon juice is a great source of vitamin C and potassium, contains B vitamins and many other minerals. Vitamin C is commonly known for it’s immune supportive and antioxidant qualities. The group of B Vitamins support mood and mental health through the proper functioning of the nervous system. B vitamins are water soluble, that means they are not stored well in the body, so they must be constantly replenished. Minerals are critical for the proper functioning of cells, organs and all body systems. Lemon juice is also alkalizing to the body. Alkalinity reduces inflammation and keeps the blood and body oxygenated and the cells healthy and vibrant. Bad bacteria, yeast and fungi prefer an acidic environment, so maintaining alkalinity reduces the presence of these harmful critters that use up our valuable energy. Lemon juice also stimulates the liver, promoting enzyme and bile production and aiding in proper, easy digestion throughout the day. Lack of acidity in the stomach can lead to heartburn, digestive discomfort and bloating and prevents the proper breakdown of food, reducing nutrient absorption and increasing the risk of leaky gut. Increasing your water consumption is one of the easiest (if not the easiest) ways to instantly improve your health. Water is the universal solvent and highly alkaline. It’s the primary component of all bodily fluids and is required for every body function. Digestion is hugely impacted by the amount of water available to the body. Absorption of nutrients and elimination of toxins and waste relies on water. With dehydration comes a whole host of mild to serious problems. Many common symptoms like headache, fatigue, drowsiness, dry skin, muscle cramps and constipation can be attributed to simple dehydration. It’s such a easy thing to remedy, yet majority of people, upwards of 70%, are chronically dehydrated. Regardless of how much water you drink during the day, your body will need more when you wake up. Drinking at least two (though I recommend four) cups of warm water immediately upon wakening will hydrate, cleanse and flush toxins that have built up overnight. It may also reduce food cravings. It’s said that there is potential to lose 5 to 10 pounds simply by increasing consistent water intake. The benefits of drinking water and maintaining hydration are nearly endless. You’ll never know how good you could feel until you’re truly hydrated. Why warm water? Warm water relaxes and soothes the digestive system, increases blood flow to the abdominal area and also flushes out the lymphatic and urinary systems. Warm water helps to break down foods, especially fats, rather than hardening them, like cold water can do. Drinking warm water in the morning raises and regulates body temperature and boosts metabolism, stabilizing it for the rest of the day. Sodium itself is an important electrolyte responsible for water absorption, water secretion and overall water balance within the body. It plays a part in many other areas, like all electrolytes, including muscle and nerve function and cellular communication. Sea salt also contains other macrominerals and trace minerals required for nearly every function in the body. Adding a pinch of sea salt to the lemon juice rounds out the mineral profile in this refreshing tonic. Unfortunately, like many things, salt has been over-processed, refined, abused and accused. It is found in extremely high amounts in heavily processed foods and it definitely can be harmful if consumed in excess (especially in conjunction with all the destructive components in processed refined and fast “foods”). In quality sea salt the natural mineral balance is maintained. I am a believer in the wisdom of nature and trust that this natural ratio of minerals is best for my body. *note: table salt has been refined to contain no additional minerals apart from sodium. It does however, contain up to 2% “anti-caking agent” which isn’t required to be listed in the ingredients. The source and composition of this additive is unclear. Personally, I’m not that frivolous with something as important as my body. If you are concerned about the lack of iodine in sea salt, as it isn’t added later like in table salt, consider a good quality iodine supplement or add some sea vegetables to your diet. Sea vegetables, algae, seaweeds and kelp contain many other valuable nutrients as well in their natural, whole food form. *important* if the lemon juice is not diluted enough it can erode the enamel on your teeth. Do not brush your teeth immediately after drinking lemon juice, diluted or not and please make sure that you use a minimum of 3 cups water. First thing every morning – before eating or drinking anything else – add the lemon juice to the cold water and then add the hot water after. Vitamin C can be damaged by high heat. Try to give yourself enough time in the morning to honor yourself and your body and give gratitude for another day on this beautiful planet. Previous Post My Favourite: Bone Broth! Next Post 5 Awesome: Berries!